After Spider-Man, the Hulk and the X-Men, by the time Thor, God of Thunder, was created, I had done so many superheroes with superpowers that I was hard pressed to think of a different kind of superhero, one that the readers hadn't seen before. That's why I decided to do a series featuring Thor. I thought it would be fun to borrow a god from mythology. I chose to play with Norse mythology in particular because people were too familiar with the Greek and Roman gods and I wanted my strip to seem really new. The same held true for Dr. Strange. In his case I wanted a hero who could use magic as a weapon. And, of course, a Master of the Mystic Arts required evil foes to battle, the more demoniacal the better. I couldn't have him fight ordinary gangsters and litterbugs. Speaking of powerful villains, I really went all-out in the case of Galactus. He was so much more powerful than anyone else that he seemed to have the status of an actual demi-god. Remember, I was trying to top myself in the creation of villains as well as heroes, and I wanted Galactus to be as powerful as possible. Somehow, though I really wasn't making an attempt to create any sort of mythology, one started to develop on its own. The stories and characters just seemed to have struck a chord with a lot of people. Speaking of striking chords, with one glance at the essays in this book (and by the way, I love the title, "The Gospel According to Superheroes"), you will encounter scholarly insights for your philosophical, literary, truth-seeking self as to how it all came to be. And why not? Comics have been published since the 1930's and their heroes and villains have become a part of our lives and our culture and, yes, even our belief systems. In fact, as I've told my friend and contributor to this book, Rev. Dr. Chuck Robertson, I don't feel there'd ever be any disharmony in a conversation between Dr. Strange and an Episcopal priest if they chanced to meet. After all, Doc Strange believed in fighting evil and obviously a priest would feel the same. 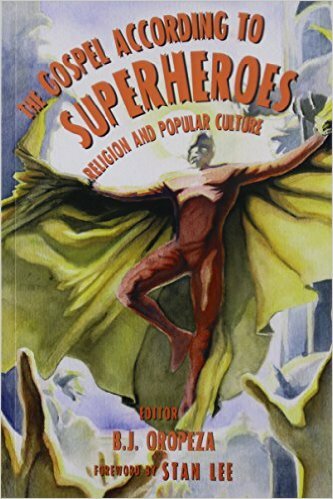 Now, believe me, I wasn't consciously trying to inject religious themes into my stories, but the chapters in this book will clearly demonstrate how religious and mythological themes are often dramatically intertwined in comic books. Another important point (well, important to me, anyway) is the fact that I scrupulously tried to avoid any reference to any specific organized religion. I thought of myself as an "equal opportunity writer." The only religious/philosophical themes I intentionally attempted to insert in anything I wrote can be summed up in the one code of ethics I've always tried to live by - "Do unto others as you'd have others do onto you." I feel that if everyone followed that precept we'd have a Heaven here on Earth. And y'know what? I think Dr. Strange, Thor, and the Silver Surfer would agree!